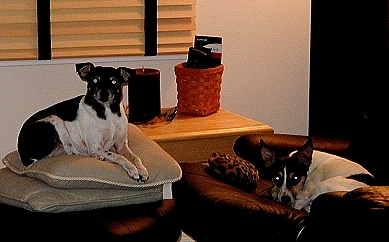 Roxy, Zippi, Eddie, & Billie each have a page of their own you can visit for more pictures. You can also visit with some of the dogs we've fostered. Roxy & Zippi in relax mode. Roxy talking to the camera; Eddie ready to investigate it! 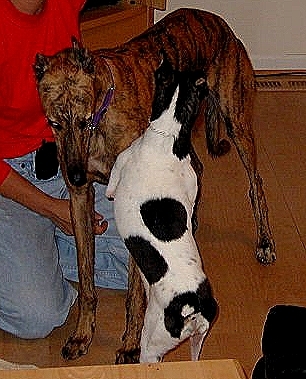 Zippi reminding Billie that HE is the big dog of the house. Please spay and neuter your pets! 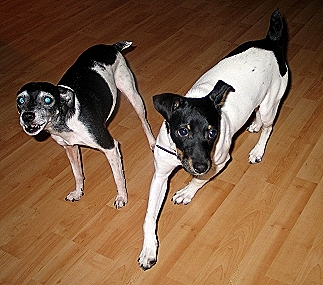 This Toy Fox Terrier Ring site owned by Bethany Adams.